Many new models were released in September, bringing new vitality to the mobile market and offering users more choices. For many users, the performance of a smartphone has a great influence on the using experience. What’s new in Antutu performance rankings of September? Is your phone on the list? 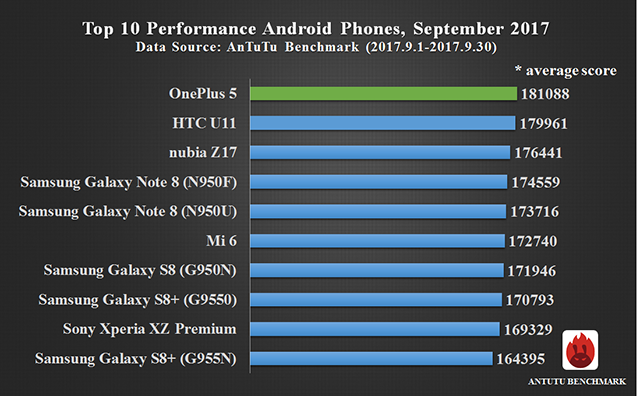 Check out Antutu benchmark results for the 10 best performance smartphones of September. 2.Period of data statistics: September 1, 2017 to September 30, 2017. 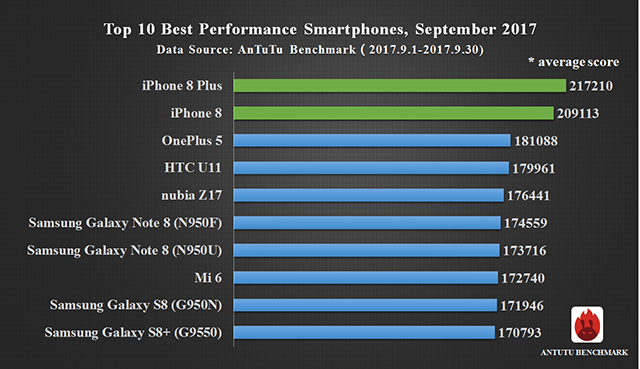 According to our most updated ranking list in September, iPhone 8 Plus and iPhone 8 which were officially released in September won the first place and second place respectively, both with an average Antutu score of over 200,000, which obviously widened the performance gap between iOS smartphones and Android smartphones. Nevertheless, the Android camp still has excellent performance and took the remaining eight out of ten positions on the list. As usual, apart from the overall performance ranking list as measured by the average Antutu score, which included both Android smartphones and iOS smartphones, we also included separate lists based on different operating systems to help you better understand the list. First let’s have a look at the iOS list. 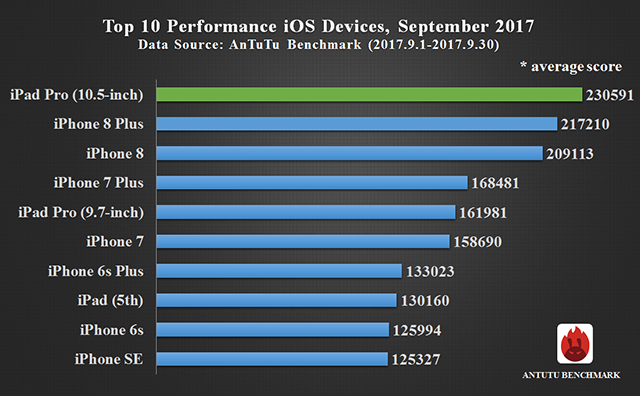 From the iOS list, we can see that the 10.5-inch iPad Pro continued to top the list with an average Antutu score of 230,591, followed by the newly released iPhone 8 Plus and iPhone 8. with an average Antutu score of 21,7210 and 209,113 respectively. Both of the two new iPhone models are powered by the brand-new A11 processor which brings earth-shaking changes in performance, outperforming its predecessor iPhone 7 Plus by over 40,000. With regard to the Android list, the top 10 positions were all occupied by Snapdragon 835-powered smartphones. The top three were still OnePlus 5 (181088, #1), HTC U11 (179961, #2) and nubia Z17 (176,441, #3). The top new comers to the Android list are the newly released Samsung Galaxy Note 8 series. In particular, Samsung Galaxy Note 8（N950F）is powered by Samsung Exynos 8895 processor and ranked #4 with an average Antutu score of 174,559 while the N950U version is powered by Snapdragon 835 processor and ranked #5 with an average Antutu score of 173,716. Other high-performance smartphones in September also include Mi 6 (172740, #6), Samsung Galaxy S8 (G950N, 171946 ,#7), Samsung Galaxy S8+（G9550, 170793, #8）, Sony Xperia XZ Premium (169329, #9) and Samsung Galax164, 395, #10). Generally speaking, with the powerful A11 processor and the natural advantage of iOS system, iPhone 8 series may be the best performance smartphones in a long time, and will be the first choices for many phone geeks. Meanwhile, iPhone X is also worth anticipating. With regard to Android camp, with several much-anticipated new models hitting the market, the ranking list tends to be stable. We can only expect that the next generation Snapdragon 845/855 to outperform iOS devices. The above data reflects the changes of smartphone performance for September 2017. We also listed the top 50 performance smartphones in Antutu official website. For more information, please visit Antutu official website or download AnTuTu Benchmark and check in the menu of “Ranking”.